He’s the son of my Ancona, Tommy (RIP). His mother…. I think she was my Khaki Campbell. I’m Momma Duck to Duckie. I’m momma, because when he hatched, he imprinted on me. A bird will imprint on whoever takes care of him within the first two days of their life; be it a bird, cat, or human. Duckie was the first duck egg that hatched on his own, and survived from the incubator. Hatching waterfowl in this dry climate is a lot harder than hatching chickens. We had a hard time incubating duck eggs at first. We were incubating the eggs because his mom died, and I was trying to hatch the eggs she left in her nest. He’s always followed me around, and comes running when he sees me. I can also call his name, and he will come from where he is, and run to me. But he has this habit….. he nibbles at me. (He also now nibbles my son, but no one else in the family.) If he sees me, he runs up & nibbles at me. Every. Single. Day. There is a video of him doing this at the end of this post. Mostly it’s just little innocent nips. However, sometimes he can hurt. My legs, my hands, and if I’m not careful like this morning, my lip. Yup, he got my top lip good this morning. Have you ever seen a duck’s bill? It’s serrated, like a knife. Those little serrations hurt when they scrape along your skin. They also have a little hook at the tip of their bill. It pinches when they bite. Instant blood blister! He doesn’t nibble to hurt me, but ouch. He’s given me numerous blood blisters over the last couple years with his ‘love bites’. But, for all the pain, he is my favorite. He’s a sweet duck; he lets me hold him, and comes when I call him. He likes to be held over the shoulder like a baby. He has become “king”, which is top-dog of the duck flock, so he’s gotten a bit more aggressive with the others in the last year or so. When he’s around me though, he’s like a cat, doing figure-eights around my legs when I walk. I think the nibbles are his way of saying, “Pay attention to me!”. His best friend is Lucy (yes, ducks have BFFs). They go everywhere together. I hatched Lucy the same time Duckie was born, but I had to remove him from his shell. They were in the brooder together, and they’ve been pals ever since. 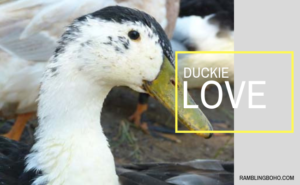 Even though Lucy isn’t as friendly as Duckie, he’s a good friend to him.